Founded by students in the early 20th century, Wisła Kraków (pronounced “víswa krákuf) have earned a spot in Polish football's elite, especially after turning into a dominant power in Poland the first years of the 21st century, time during which they won most of their many titles. In their way longer than 100 years history they obviously had their ups and downs, but through their triumphs and failures alike, they have established themselves as an undisputed Polish football Great, with capital G.
TS Wisła, Towarzystwo Sportowe (Sports Society) Wisła, that is the name the founders of the team chose back in 1906, with Wisła being the Polish word for the river that in English we call by the name Vistula. Running through the heart of Cracow, and playing such a major role in the city's life, it made sense to base the name of the team on that of the river. What started out as a modest team of students, managed to reach fame at national level in the twenties, when first they won the Cup, in 1926, and right after that, their first back-to-back Championship titles, led by legendary Henryk Reyman, a figure so big in Wisla's history, that their stadium is named after him. Soon after World War II, Wisla (which is how the team's name is written in English, given that the Polish “ł” character is tricky both to write and pronounce) made their mark again, winning another pair of consecutive Championship titles, in 1949 and 1950. Actually, they topped the league in 1951 as well, but for some reason the Championship title that year was awarded to the Cup winners, Ruch Chorzów. Interestingly, Wisla are following the official line of the Polish Football Association, and even on their official website they do not count that title as one of the many, either way, they have won. The second half of the 20th century was poor for Wisla, in terms of titles won, since they only managed to lift a Cup trophy in 1967, and add a fifth Championship title to their collection in 1978. Things, though, were meant to change spectacularly in the late nineties, with the club's successes surpassing even the most extreme expectations of their most optimistic supporters. The club was turned into an SA, Spółka Akcyjna, a Joint Stock Company, money was pumped into building a strong team, and almost immediately, in 1999, Wisla inaugurated an era of glory unprecedented in the club's history, one that saw them win almost every single Championship title until 2011. If there was one season that could be considered the best of the best, that was 2002-03, when the Cracow team won the double, and reached UEFA Cup's last 16, eliminating teams like (mighty back then) Parma and Schalke, before falling victims to Lazio. Wisla's stadium, named after legendary Henryk Reyman, February 2016. In October 2011, the long process of reconstructing their stadium was finally over, and ever since then they have been calling home a splendid venue fit for champions. 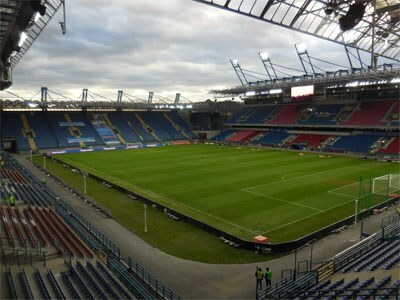 Ironically, Wisła Kraków have yet to celebrate winning a title in their modern fully reconstructed stadium, but if there is something their fans have learned over the years, is that their wait will, sooner or later, come to an end. Wisla's nickname is Biała Gwiazda, White Star, and a look at their logo explains why. Their emblem has changed through the years, but a white star has always been included. Plus, every now and then, a simple big white star is what is chosen for the stop on their jerseys right above the heart, instead of the club's official logo which can be seen here.